So it was carnival in South America, but we didn’t want to ignore the British tradition of pancake day! Sophie’s cooking group stepped up and made us pancakes for breakfast (with the help of Alejandro and Danilo) on what we think was pancake day but there is still debate around that topic! Jon arrived just in time for the pancakes and the day carried on in the normal fashion of playing with the kids, but a few of us got to go to the nursery for some ´mummy´ time! However, we were slightly put off when we had to serve the kids rice and fried chicken blood! 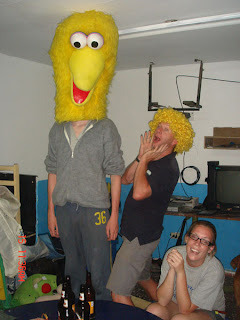 That night the Peruvians plus Fred, Sophs, Bart, Jon and Emily had a bit of a late night and a few of us woke up with either giant puppet heads by our beds or drawings on our faces........ The weekend was approaching and for family Sunday we were doing a ´save the planet´ play and song, and after a mammoth rehearsal with Lucho the group shot off to Camilla´s first birthday party. We were greeted with plush leather sofas and fantastic food, the night continued with a series of videos such as ABBA´s greatest hits which led us on to make the decision that Mamma Mia was the choice of musical for the last family Sunday, which made Lucho extremely happy! 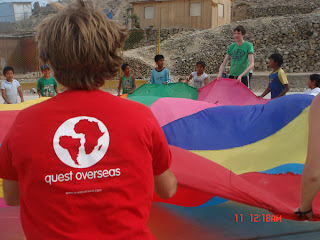 The next day we were greeted by lots of children for the fair and then to the much loved piscina. That evening we went to Camilla´s SECOND birthday party where they had blocked the road in order to fit in the DIY Disney castle. The place was drenched in disney and not only did she have one cake, she had 3!!!! We then got treated to a disney show which the children loved. I then found Emily holding the 21 day old baby that I had been dying to hold all evening, so Emily, Laura and I spent time holding and cooing over the baby. When we returned to our lovely home, we discovered that Ana Mariela´s family were having a fundraising party next day where the majority of us headed for some drinking and dancing with the locals. Family Sunday started with us dressing up as the usual Disney characters, then Fred took to the stage as Harry Potter with his glamorous assistants, however, the magic tricks were not met with much applause from the audience! The ´El Planeta Hay Que Salvar´ play got much the same reaction but we carried on with a super size Hokey Pokey which was so well received we had to do it twice! 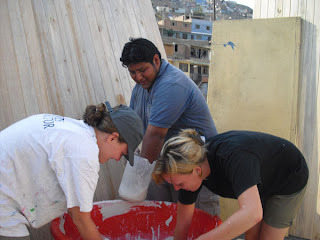 We then began construction of the first house and painting of the school. This is when “Jesshope and Leechman Construction Company” was created due to Emily and I being so speedy with our frames. By the next day house number 1 was finished and so was the painting at the school. The next day school began so we have screaming children not wanting to leave their mothers every morning arriving at 8am! We also began the second house but Lucho found us to get revenge as earlier we removed the ladder while he was on the roof. That night we began rehearsal for the family Sunday in which the boys were dressing up as girls and dancing to Shania Twain ´Man I Feel Like A Woman!´ Us girls were feeling a bit left out and wanted to dress up as boys and dance to 5ive (Debster was especially keen), however Lucho was not keen on this idea so we ended up doing the clown dance. The group illness also began with everyone feeling really ill apart from Fred! It was a struggle to find a free toliet for that week! That evening, a discovery of maggots and other things were discovered in the box/fridge and the mystery of the group illness became resolved. Nice! After that discovery group hygiene was stepped up several notches, with copious amounts of bleach, hand sanitizer and the permanent removal of the box/fridge thingy! The fair had to be cancelled on Saturday as the majority of the group was ill and we had only had one rehearsal for family Sunday! However, rehearsals were short and sweet due to the power cut. 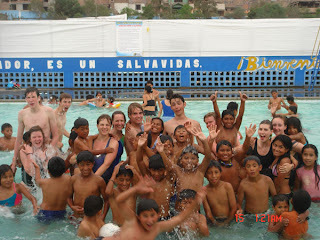 After pool time and lunch we packed our bags for Miraflores. The hostel in Miraflores was very nice and a far cry from our accommodation in Villa Maria. We all headed off our separate ways but later all congregating in Starbucks! Lucy, Alex, Fred and Sophie all got piercings. We then headed back to the hostel to get ready for our night out and more importantly for the HOT SHOWERS!!! The girls, especially those in the long line for Zoe´s hair straighteners took a very long time to get ready. We then went to a restaurant but the majority of us were still recovering from the illness or still ill had to chose stomach friendly meals! The meal was clearly too much as Anya, Sophie, Emma and Alex had to make a quick exit back to the hostel as were feeling too ill. The rest of us headed over to Barranco, however some more of us weren't feeling too well so Bart, Tom and I headed back to the hostel. The others then headed onto a very sweaty club where Shania Twain Í feel Like A Woman´ came on, so much to Fred’s excitement he grabbed the DJs stool and gave the club a sneak preview of the boys dance for family Sunday! Tom woke up the next morning at 8.30am so he could watch the football, but he discovered that it wasn’t actually showing on the TV so he proceeded to spend the rest of his time in Miraflores watching it on the computer! The rest of us went out for breakfast. We headed back to Villa Maria to prepare for family Sunday and dress the boys up in the girls’ clothing. The girls did their clown dance first which was actually just a build up until the boys hit the stage. The boys lost all dignity as they walked on stage dressed up in dresses and make up, Fred’s dress was ridiculously short but we decided he looked very pretty as a girl. The dance went down a storm and they were called on for an encore! The next day we put up our first house! All went well and the family were very grateful and happy with their new house. That night we had a surprise birthday party for Danilo (which was actually on Thursday but we forgot!) The majority headed off to bed after the cake though as the illness was still rife. House 2 was put up and we got fed a lovely lunch as a thank you from the family. That night was the first rehearsal for Mamma Mia. House number 3 was put up the following day which didn’t go completely smoothly due to a bit of wood cracking and the door not being able to fit but it all ended up ok. This family had 12 children and only 3 beds so being able to give them extra living space was really lovely and they appreciated it a lot which was shown by the mammoth lunch they gave to the group who put it up. They had to literally roll down the hill back to the school where they were all looking a bit worse for wear especially Emily who gained much respect as she finished everything she was given! Rehearsals went on late into the evening with Lucho playing many pranks on us such as cellotape across the bathroom door, butter on the door handles and a stink bomb in the girls room! The fourth house went up the next day and we made a record of putting it up under 2 hours (a possible Quest record????). We then had the first of our TWO lunches as we had also been invited to Ana Mariela’s house for a thank you lunch (we raised well over our target- so thank you to everyone, she is going for her first scans etc on Wednesday and Anya and Debbie are going with her). After two lovely lunches we rolled down the hill again and then went off the play with the kids and also start construction for the final house. Saturday was predicted as the day from hell as we had the fair, followed by a sports day, however both were extremely successful especially the sports day with a gringo in charge of a team, so there was a lot of competition between who’s team would win. Anya´s team won and all the ninos we rewarded with sweets and prizes. That night the group slaved away at rehearsal for Mamma Mia, which was looking good. The next day Rob returned to Villa Maria. Family Sunday began with a can can dance in the munecas and then we did Mamma Mia, however I managed to fall through one of the missing planks in the stage and get what I thought was quite a severe injury but Rob later told me it was only a minor scratch. Mamma Mia went really well and was definitely our best performance to date. The next day we started our mural at the school which is space themed and is being finished as I speak. Some of the group finished off the construction of the 5th and final house, however they ran into quite a few technical difficulties and they are a bit nervous about putting it up! Last night we went out to dinner at this really nice pizza/burger place as it is one of our last evenings! Rob then gave us half of our trek talk, which started off a little scary but we are all looking forward to it now and it sounds good fun. Today is our last full day in Villa Maria, which is actually quite sad! 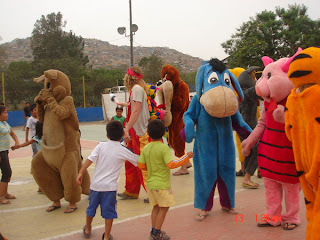 Tonight is the leaving party so we are having a BBQ which Lucho is cooking for us and then tomorrow we clean up and pack up and head off to Miraflores for 2 nights. Off on the expedition Friday! We've got to be united to save earth! Earth Hour is practised at large scale in all developed and developing countries but there has been more publicity and awareness this year, as well as participation from large corporations like http://www.commit21.com/ which is a good sign - that there is still hope and that people still care! Let's all do this, no matter where you are! Saturday, 28 March 2009. Lights off from 8.30pm to 9.30pm! Project and Expedition updates from the field - some to show the great work which is going on at our projects in South America and Africa, others just to make us jealous we're stuck here at home! Tanzania Project Completed. Job Done!